I remember sitting on my parents' bed one evening after dinner when I was seven years old, squeezing into a spot next to my older brother, Marc. In the coziness and safety of their room—walls clad in purple fabric and a white shag rug underfoot—my parents began to share their stories. There was the time my mother's family was living in Grenade-sur-Garonne, a small village in southwestern France, and their backyard housed a hole in the ground to be used as the toilet. One of their chickens accidentally fell in and, flapping its wings frantically, spread the hole's contents all over the yard. My brother and I doubled over in laughter, unaware that the story was from those dark days, lightened for our listening pleasure. My mother didn't mention that they had left Paris to escape the approaching Nazis, or that her parents had placed her in a convent in nearby Toulouse for safety, or that my grandparents had been deported to concentration camps. 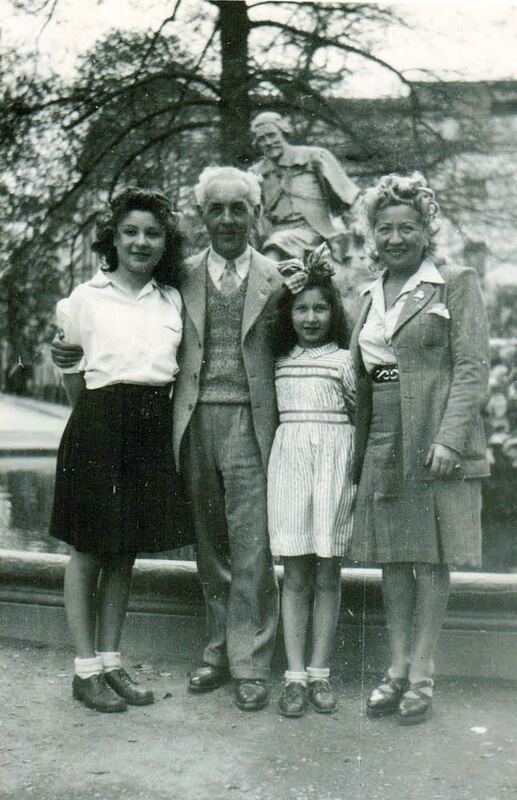 Reunited after the war in 1945, from left to right, Caren's aunt Yvonne, grandfather Maurice, mother Renee, and grandmother Annette. When my father told us that he skied several miles to and from school during his youth in Romania, he didn't mention that he was kicked out of school for being Jewish, or that he had to get a job at age 12 to help support the family, or that he eventually left his family behind to travel with a Zionist youth organization to what was then called Palestine. 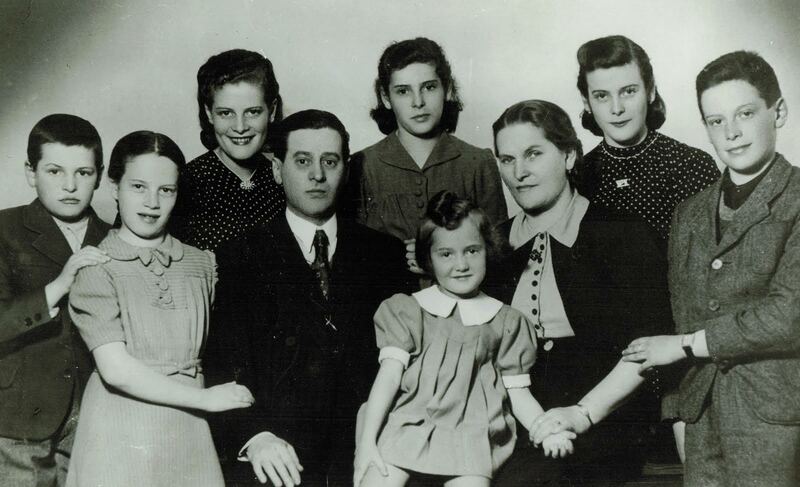 Caren's father Bernard, far left, with his parents and siblings in Romania in 1939. Despite the laughter in my parents' room that night, I knew even at that young age that there had been trauma in my family. My maternal grandparents had tattooed numbers on their arms. I knew this meant that they were concentration camp survivors. My grandfather spoke incessantly about Hitler and the Nazis—the topic was often hanging in the air. While I didn't realize the magnitude of their experiences, I knew enough to feel anxiety, fury, and sadness over the tragedies they had endured. When I was in high school, my mother began to write down her stories. Eventually she published them as a memoir, Don't They Know the World Stopped Breathing? It was only then, when her story unveiled itself in such detail, that the enormity of my family's situation crystallized. Only then was I able to begin to comprehend—if it's even possible—the breadth and depth of the instability and hardship that both of my parents experienced. Learning my mother and father's stories—both as a giggling seven-year-old girl and a more prepared young woman of 17—had a profound impact on the way I see the world. Since becoming a mother myself, I have also made a point of sharing our family history with my three children—now ages 14, 18, and 21—and I do not hide the tragedies that define much of our past. When they were little, I told my kids stories about Mirka, my mother’s German Shepherd. Mirka walked my mother home from school each day, with a petit pain au chocolat my great-grandmother attached to the dog's collar for my mother to snack on while walking. When my kids got older, I told them how my grandmother asked the neighbor to tie Mirka to a tree and shoot her with his rifle. The family was leaving to seek safe haven in southern France, and was unable to take Mirka with them. 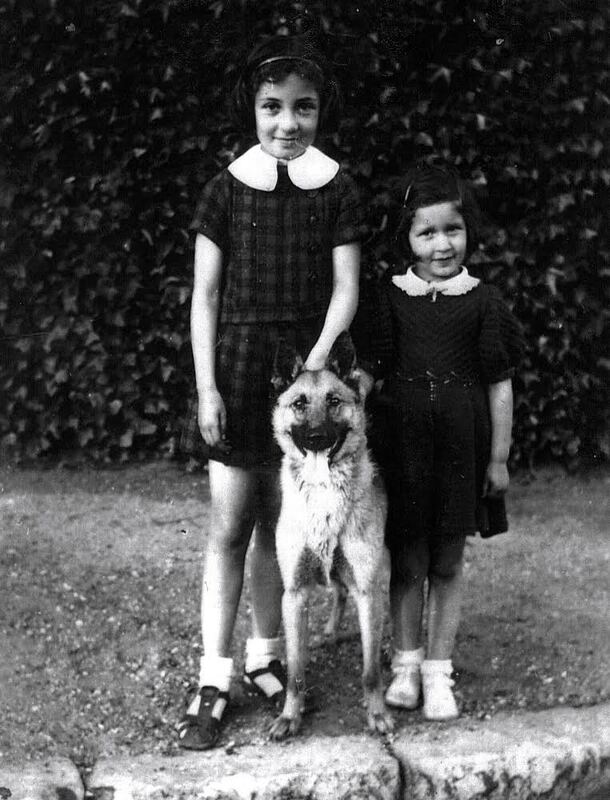 Yvonne, left, and Caren's mother Renee with Mirka, 1938. By the time I left for college, my mother and aunt, Yvonne, were involved with various survivors' groups, some specifically for "hidden children" (children who were forced to disguise their identities or physically conceal themselves from the outside world in order to survive). Through this connection, my mother began to speak in schools, sharing her stories with students, teachers, and many Facing History and Ourselves classrooms. My children have heard my mother speak publicly, have listened to her talk about being separated from her parents, life in the convent, her reliance on her older sister, and the family's post-war reunion. My children have visited Yad Vashem, Israel's official memorial to victims of the Holocaust, and walked through the experiential Palmach Museum, where they learned of their grandfather's involvement as a young man fighting for Israel. It is hard to know at this point how deeply the stories will affect them. My hunch is that they will carry these memories—thinking, considering, and sharing when it feels relevant and meaningful. My eldest daughter, a psychology major in her senior year of college and a former Facing History intern, has been studying trauma for seven years, beginning with a high school science project focused on PTSD (post-traumatic stress disorder). When I asked her why she is so drawn to trauma, she looked at me and simply answered, "My grandmother." I am still learning how my family history defines me—how it has both saddened and enriched me; how it has simultaneously weighed heavily on me and provoked a yearning to forge ahead with verve in nearly every project I take on; how it has made me wistful, but also enabled me to seek adventure and seize the moment. My family's memories and stories live on in me, and now in my children. And I hope that I'll have opportunities to carry them forward to the next generation. I think I'll start with the tale of the chicken falling into the toilet hole, and then ask, "Did I ever tell you about the time, just after the war, when your great grandfather spent all of his money to buy and sell men's shirts on the black market and when they arrived, they only had one sleeve?" 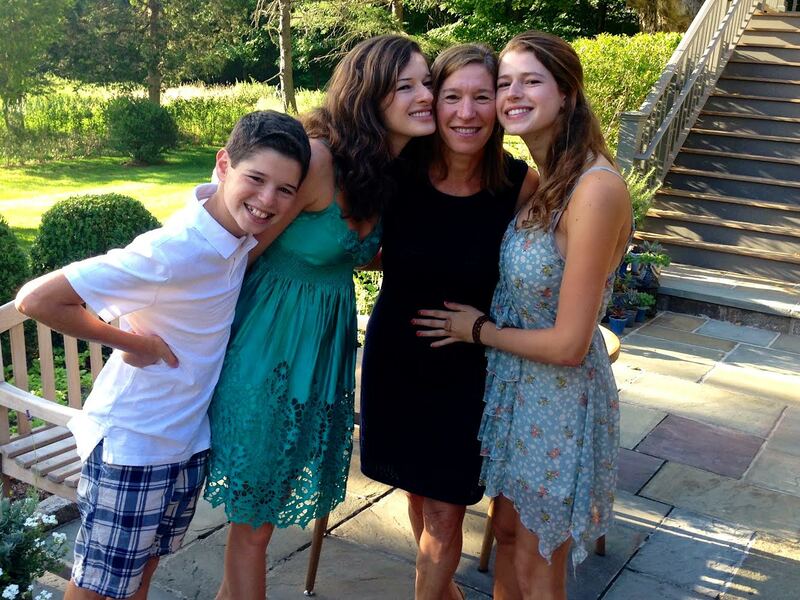 Caren and her three children, from left to right, Simon, Nicole, and Emily.